At age 4, he was 4 feet tall. Stephen Zimmerman Jr. never was the kind of kid to look down on others, though. He was raised to be grounded. He had a humble father and grew up with three older sisters. He was not always the most popular in school. Long before he was a 7-foot phenom, a McDonald’s All-American and the big man on campus, he was like everyone else, although much taller than his classmates. John Calipari, Sean Miller, Bill Self and Roy Williams all wanted to be his friend. But popularity did not change his personality. The new face of the UNLV basketball team is a hometown kid who had every opportunity to go elsewhere. But his relationships with family, friends, teammates and coaches meant too much for him to leave Las Vegas. In April 2011, Dave Rice was named the Rebels’ coach. About a month later, after Zimmerman’s eighth-grade year, he received his first scholarship offer. He was 6-9 at the time. 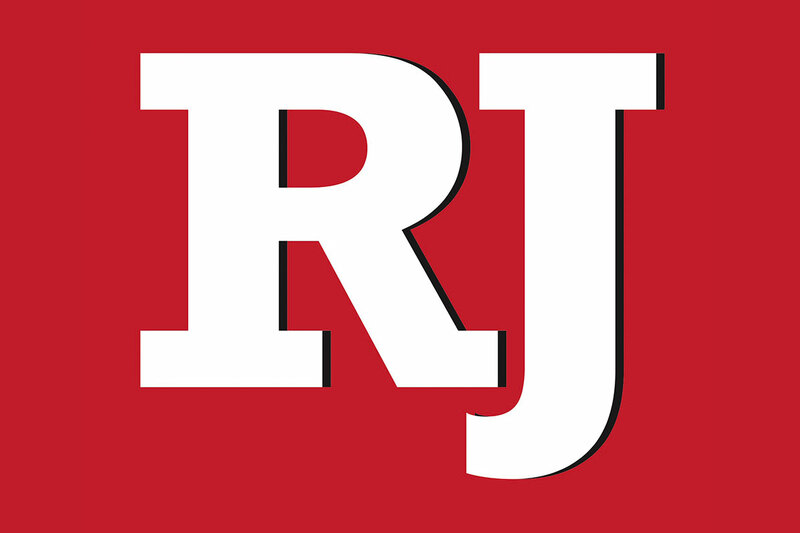 On an April day four years later, Zimmerman committed to UNLV. The Rebels missed out on the NCAA Tournament the past two seasons, and Zimmerman is expected to lead them back. The NBA might come calling for him next spring, and Zimmerman is expected to listen. There are lots of expectations for the freshman, and some are even realistic. Zimmerman was born in a Nashville, Tenn., suburb. He was 6 when his dad, after a divorce, decided in 2003 to move the family to Las Vegas, where the construction business was booming. Eric was a carpenter who later drove a lumber truck. Stephen was 6-5 — the same height as his dad — at age 11. That’s also when he picked up basketball on an organized level. “He’s been taller than me for years,” Eric said. “When he started playing, he had the advantage of being taller than everybody else, but he was also a good player. In that sense, father and son were similar. Throughout his career at Bishop Gorman High School, where he helped the Gaels win four consecutive state championships, Stephen Zimmerman became a well-known name. This year, he chose to add “Jr.” for the first time. Zimmerman’s stepmom, Lori Stevens, has been in his life for more than a decade and the two developed a tight bond. She handled most aspects of his college recruitment and watches his UNLV practices almost daily. She’s by far the most talkative one, and she pushed Stephen to basketball when he was an 11-year-old who leaned toward soccer. Calipari had a shot to lure him to Kentucky. Self made a big impression on him at Kansas. Stephen Zimmerman also made official visits — all of them with his parents — to Arizona and UCLA. He never went to North Carolina, although his dad said he was thrilled when Williams, the Tar Heels’ coach, was sitting in his living room eating MoonPies. “It was a dream come true,” Eric said. “I’ve been into sports all my life, and it was great seeing him get all the attention. It was great seeing all the coaches you read about and you had seen all those years. But he was not always set on UNLV. “I wanted to go somewhere else just because I would be away from my family and have a sense of being grown up,” Stephen said. “But that’s also a bad thing. With my parents here, they can help me out whenever. He announced his decision on Twitter in April. He said it was a “family thing,” that he felt close to the Rebels’ players and coaches and staying home felt right. He shares an apartment with freshman forward Derrick Jones Jr., who’s already known nationally for his high-flying dunking exploits. “He was the first person I called when I committed. I told him I’m going to wait for him. I wasn’t rushing him, and I told him it was no pressure,” Jones said. “Even if he went to Kansas or Kentucky or Arizona, he was still going to be my boy. I want the best for him. He’s like my best friend. 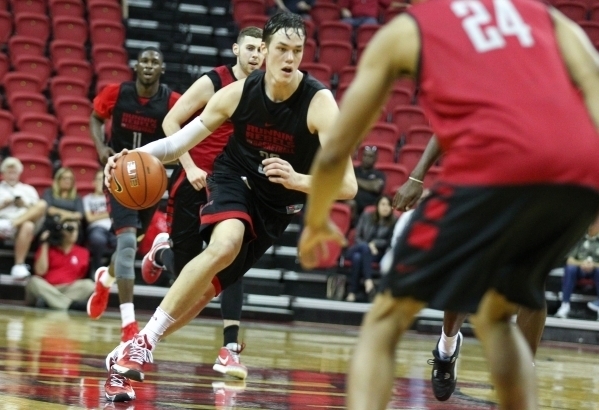 He’s almost as close to junior forward Ben Carter, another Bishop Gorman graduate who spent two seasons at Oregon before transferring to UNLV last year. Zimmerman played for Grant Rice, Dave’s younger brother, at Bishop Gorman. He and his parents also formed a personal relationship with Rebels assistant coach Ryan Miller more than two years ago, and the family’s faith in Miller was another major factor in the decision. Miller was an assistant at New Mexico when he first watched Zimmerman in the summer after his eighth-grade year. “I remember someone told me to make sure you go see him because he’s going to be the next big thing,” Miller said. “I knew right then he had a chance, and I watched him develop throughout his high school career. “He stayed humble and hungry through the process, which is important. He’s the real deal there. There is a culture of entitlement, people always telling you how good you are, and it’s hard for young kids to stay humble through the process. There is a certain guarantee of NCAA Tournament success that comes with playing at Kentucky and Kansas. UNLV has been to one Sweet 16 (in 2007) since its last Final Four appearance in 1991, the year before Jerry Tarkanian was forced out as coach. Another decision is looming. The one-and-done questions are coming, and Zimmerman’s answers are unlikely to change much. The Rebels have produced two one-and-done freshmen in Rice’s four seasons — Anthony Bennett was the No. 1 pick in 2013 and Rashad Vaughn was drafted 17th in June — and Zimmerman is probably going to be the third. Miller, whose brother Mike has had a long NBA career, already has been counseling Zimmerman on the process. Rice and Miller plan to put Zimmerman in the ideal position to succeed, which means putting the skilled big man in positions all over the floor. He’s not a back-to-the-basket center. He’s a left-hander with a soft shooting touch, smooth passing ability and a sharp sense for how to play the game. He wants to model his game and attitude after a former Boston Celtics great. Off the court, he’s got a sensitive side, which is especially obvious to his family, friends, teammates and coaches. But, he said, there is another, tougher side of his personality that he needs to succeed as a basketball player.